Been diving in Langkoi Rock? Please Vote! The main attractions at this site, especially from July to September, are the vast quantities of sharks that can be seen. 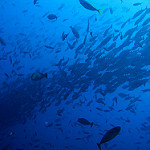 The dive site is a pinnacle that has a lot of exposure to the currents. It starts fairly shallow around 5 meters but then rapidly submerges to depths of around 45 meters. The surge and swell can often be seen from the top of the water, and the rocks drop down very quickly to much deeper water. Without these currents, on a calm day, it can be difficult to find the dive site and because of this, it is recommended to use a GPS to find the dive site. 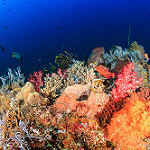 The harsh conditions have stunted coral growth but that does not mean it is not an amazing dive site. The best and easiest way to dive this site would be to go straight down and then hold on to the pinnacle. White tip reef sharks are joined by Blacktip reef sharks, Grey Reef sharks, Bronze Whalers and Hammerhead sharks. If you love seeing sharks on dives then this site cannot be missed, and it will amaze and leave most divers in awe. Pelagic fish are also a reward for any diver visiting the site, with Potato Cod found at about 30 meters. The different extremes of this dive means that it is primarily for more experienced divers. Map of Komodo, Langkoi Rock dive site.